It still doesn’t really feel like spring here in the woods, but the light has changed and I feel some hope; finally, there is a sense of forward momentum here in the construction site from hell. The last couple of weeks have been effortful for me physically, but there has been enormous payoff, so in spite of being tired and sore, I am aware of feeling accomplishment and satisfaction. You already heard about my two recent projects: the sanding of kitchen floor boards and preparation for Empty Bowls. Both were intense, requiring concentration and lots of hours of moving, lifting, and coordination (not my best thing). And, I am proud and happy to say that both were successful! I told you about the sanding of the floor boards in the arugula salad post. This weekend, the floor was installed and finished. It was challenging because we had to avoid walking on it for several days. The fumes were pretty strong, so we opted to sleep in the basement. That meant that every time we needed something from upstairs (or needed to go to the bathroom), we had to walk out in the snow, around the house, and in the front door. I only slipped on ice and wrenched my back once. I am happy to report that the floor is gorgeous! I like it so much that I’m not sure I want counters and cabinets; I’m contemplating advocating for a dance hall or a yoga studio. Due to the snow, Empty Bowls was postponed a day. My energy and optimism failed me briefly on Saturday afternoon while I was trying to get ready while dealing with fatigue, back pain, fumes, inconvenience and cold. I was convinced that all my work was for naught and that no one would show up after all. I was tired and cranky and had a little pity party for myself. But my worry was unfounded. My bowls were a big hit. We don’t have numbers yet, but I know our contribution to our recipients will be substantial. A huge thank you to everyone who participated! I am giving you a recipe that is similar in spirit to these projects. It is not difficult, but it requires some focus and concentration. Taking the time and care to do it correctly will result in satisfaction. Unlike my projects, however, it is not backbreaking. Well, it’s not backbreaking if you have counters. If you are working on an old tabletop perched on a cardboard box in the basement, I can’t promise anything! 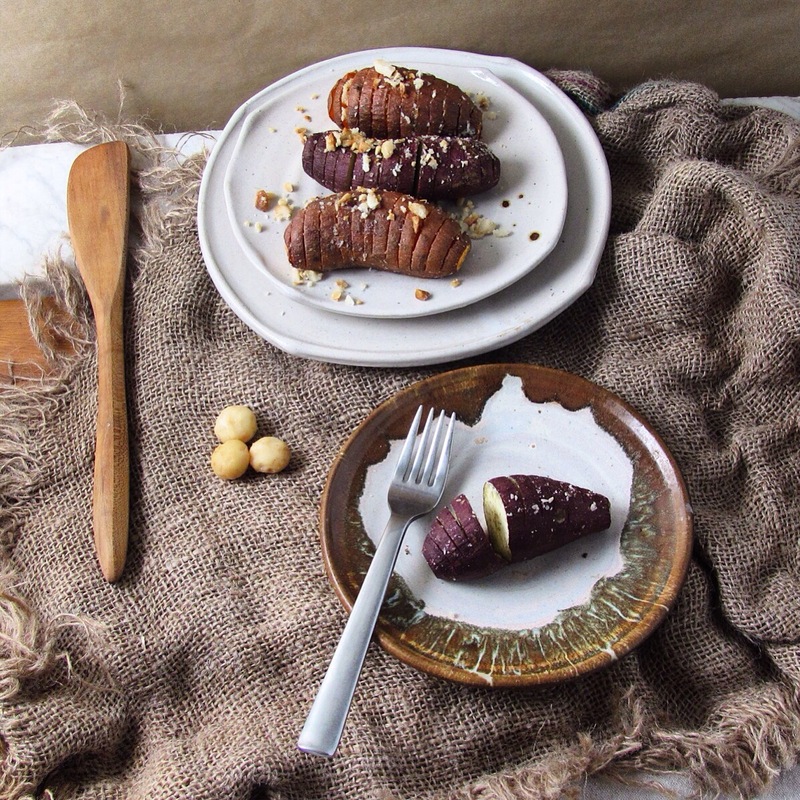 Hasselback Potatoes originated in Stockholm, Sweden in the 1700’s at a restaurant called Hasselbacken. 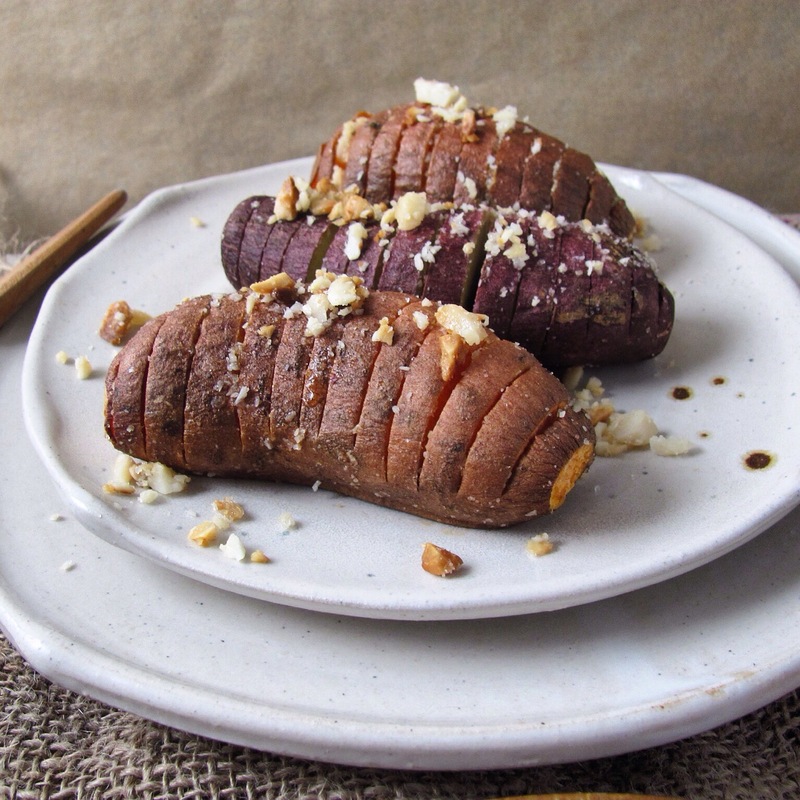 The original Hasselback was a white potato, cut into slices, but not all the way, so the cuts fanned out a bit and gave a novel appearance and some contrasting texture. 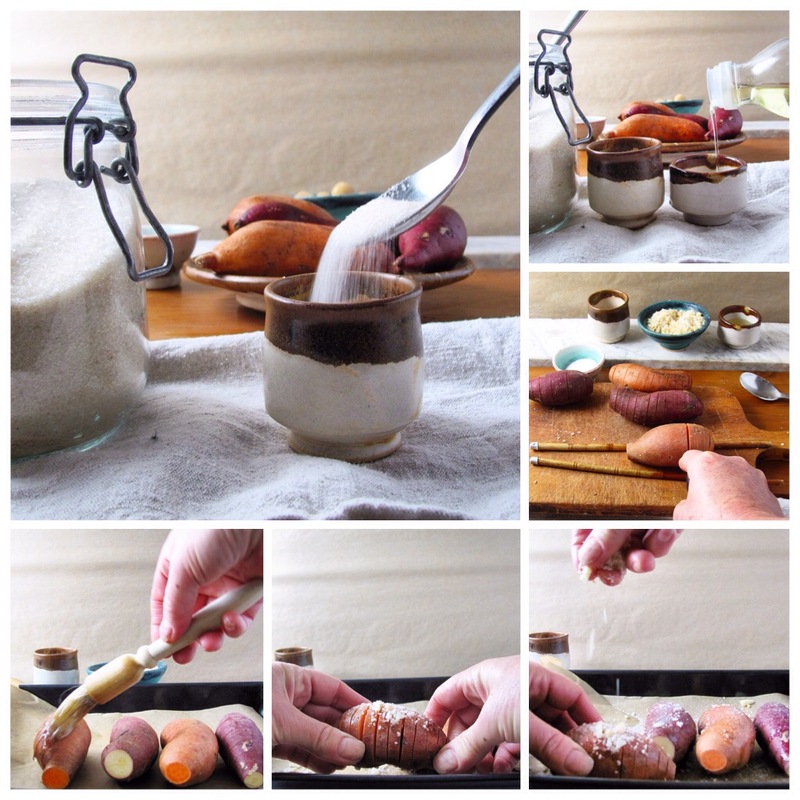 I am by no means the first person to do them with sweet potatoes, but I haven’t found anyone so far who has created exactly my version. 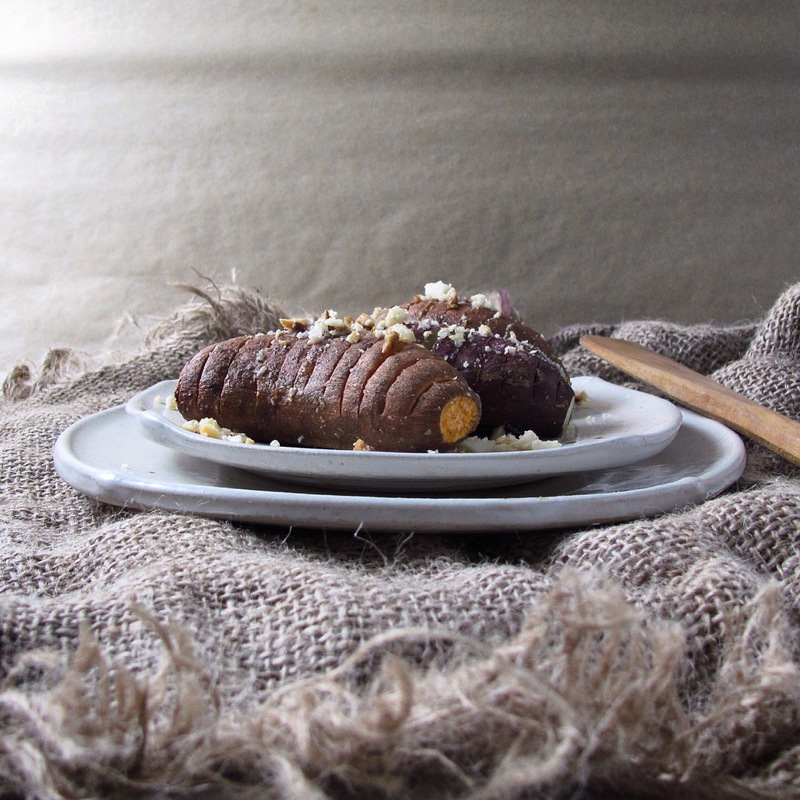 Our supermarket carries these wonderful organic baby sweet potatoes. 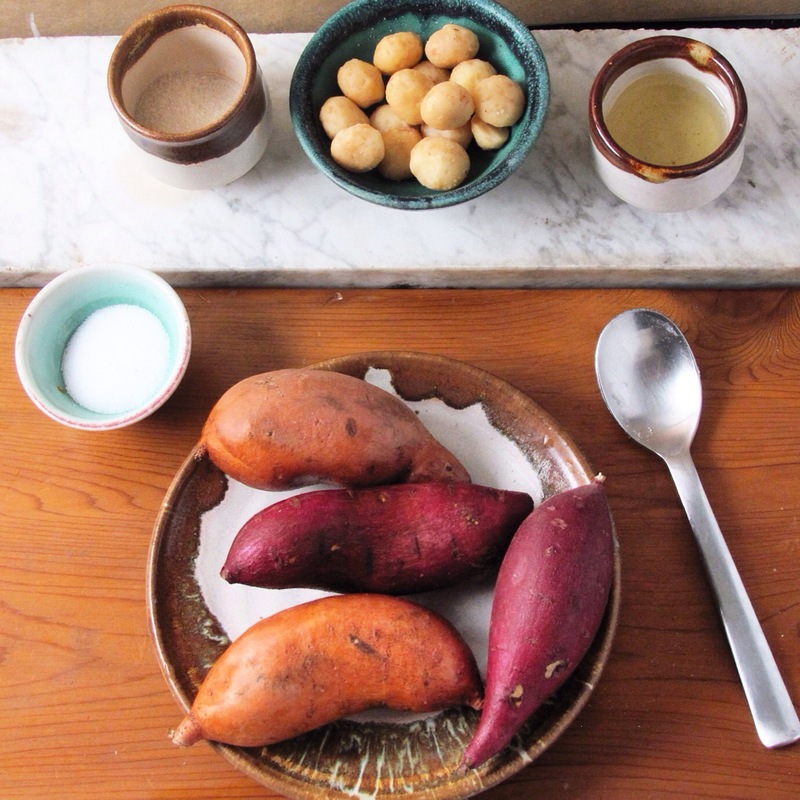 The packages say organic japanese yams or jewel yams. I doubt this label is in any way accurate; I’m pretty sure they are sweet potatoes. Some packages contain orange skinned and others purple skinned little roots. The flesh of the orange ones is orange. The flesh of the purple ones is white. Both are wonderful; the purple ones taste a little like chestnuts. If you can’t get baby sweet potatoes, make this with the smallest ones you can find; you may need to adjust the cooking time. This recipe serves 2, multiply as much as you like. *I sometimes keep macadamia nut oil around and it would be great here. But right now, I have almond on hand, so that’s what I am using. Walnut or hazelnut oil would also be great, as would coconut. But I don’t think anything terrible would happen if you used peanut or olive, either. **I have been having a major love affair with mac nuts since our trip to Kauai a couple of years ago. And the food police are now saying they are great for us. 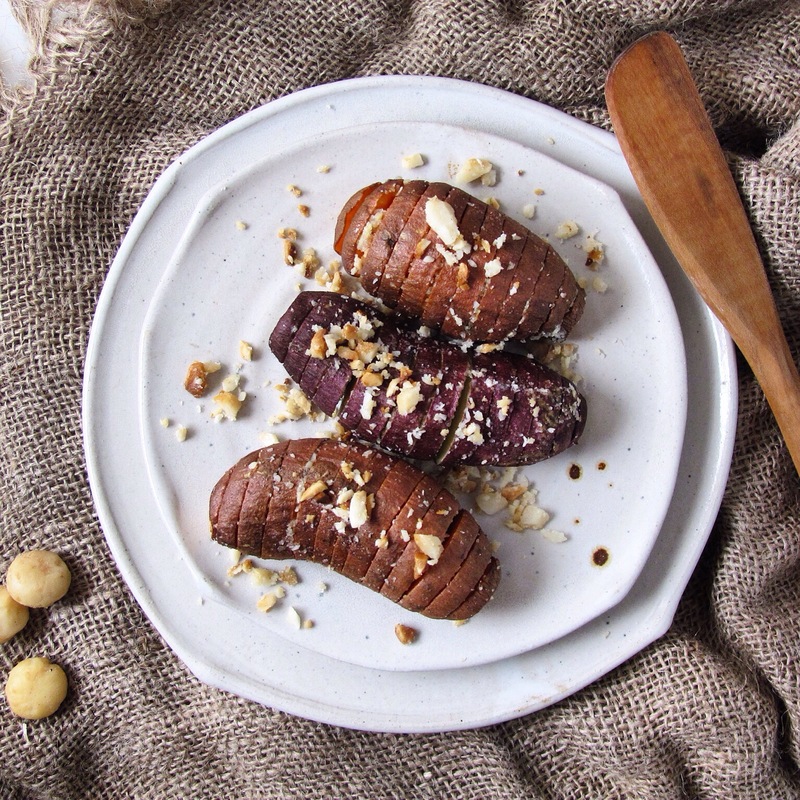 But you could happily substitute walnuts, almonds or hazelnuts. ***I am using organic can sugar for this sort of thing. But you could use refined white sugar if that’s how you roll, or brown sugar or coconut sugar. Or if you don’t use sugar, skip it. Or use honey or maple syrup. Preheat the oven to 350°. If you are using a toaster oven, don’t preheat it because everything will burn and be ruined in seconds. Line a baking pan with parchment. Now, here’s the concentration part: cutting the potatoes. It will help you if you use a couple of chopsticks (see my picture), but it’s not absolutely necessary. Make sure you have a good, sharp knife. I think a paring knife gives the best dexterity. Line up the chopsticks on either side of the potato so they will stop the knife from going all the way through it. Make cuts about ¼ inch apart, stopping a bit more than 2/3 of the way. This is fun and a good way to practice mindfulness. 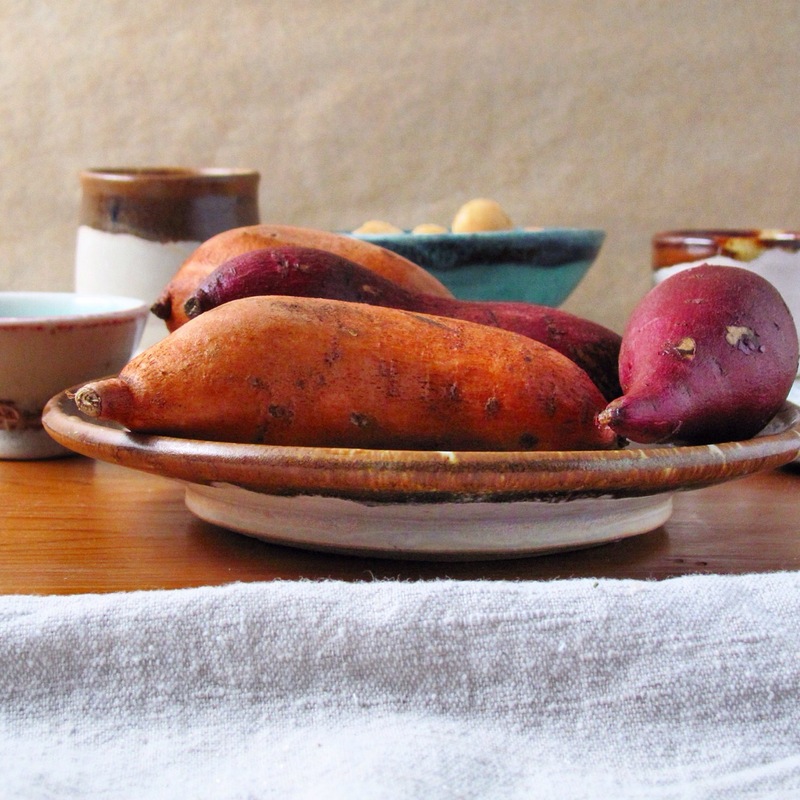 You could plan some sweet potato hash for the next day in case you mess up a few. Now, place the potatoes on the parchment and fan out the cuts a bit. Brush with the oil and sprinkle with the nuts, sugar, salt and pepper. Try to get the stuff into the cuts, but don’t make yourself crazy. If you do make yourself crazy, call me at the dr deb office. Now, bake for 35-40 minutes or until the potatoes are tender. Serve hot, gathering up all the fallen, toasty nut bits and sprinkling them on top. 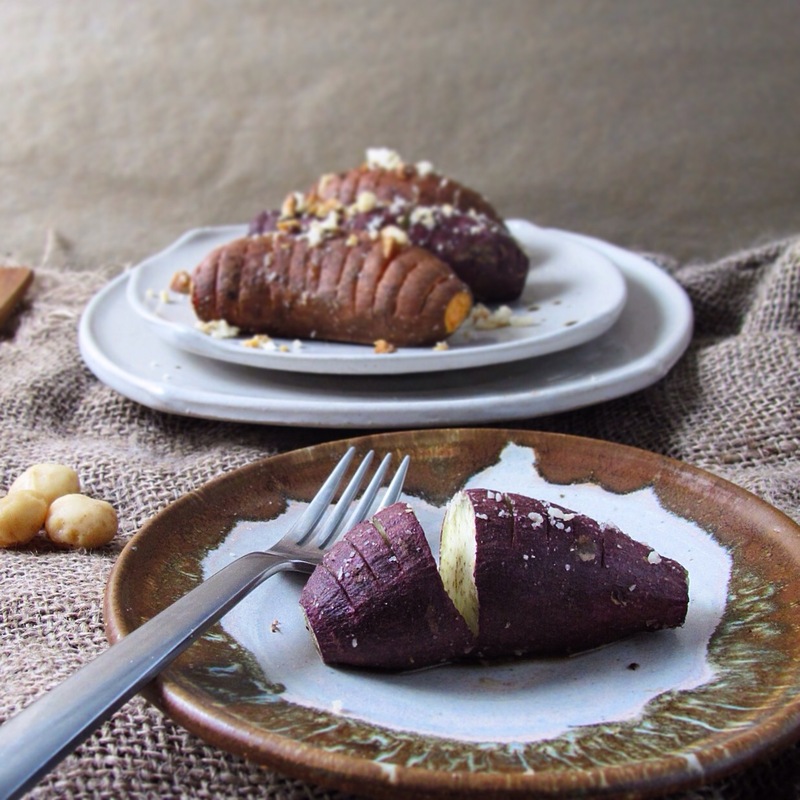 This entry was posted in roasted, side dish, vegetable and tagged dairy free, gluten free, hasselback, paleo, potato, sweet potato, vegan. Bookmark the permalink. 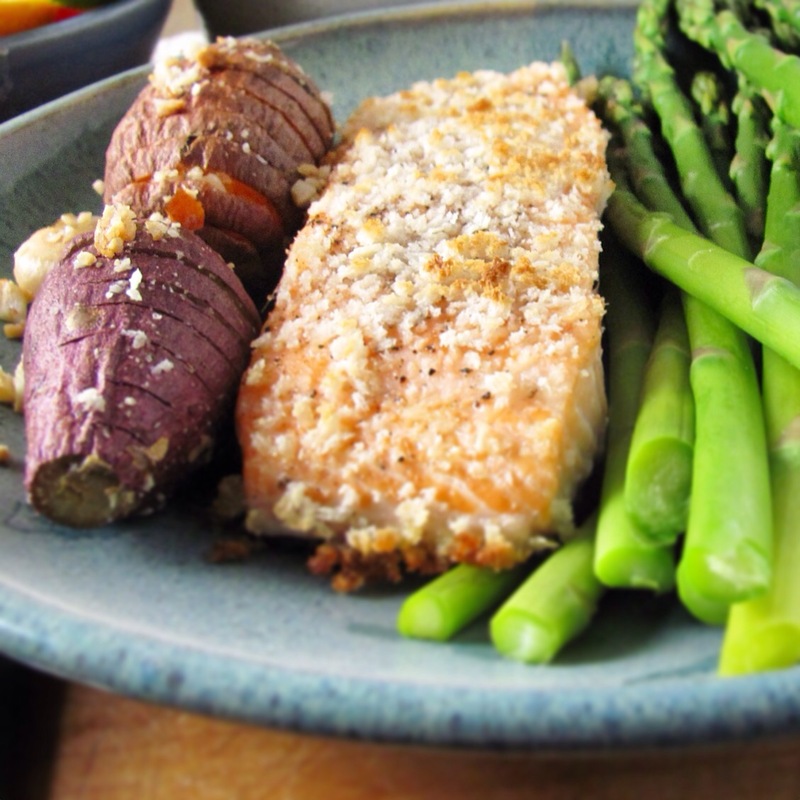 ok – I have to stop reading these recipes now – I’m getting hungry and it’s only 5:00…..
Really! Downside of thinking about food so much!